The opening night of Pets, presented by Changeup Theatre and Shadowland Theatre, started at a distinct disadvantage. The site-specific piece, set in a garage next to Trinity Bellwoods park, was wracked with winds and rain strong enough to blow over the box office tent. It was an evening suitable for the hardiest of theatregoers, as the play is presented both outside and in an unheated space, with a runtime of about two hours, and an intermission where patrons are asked to stand around in an alley. 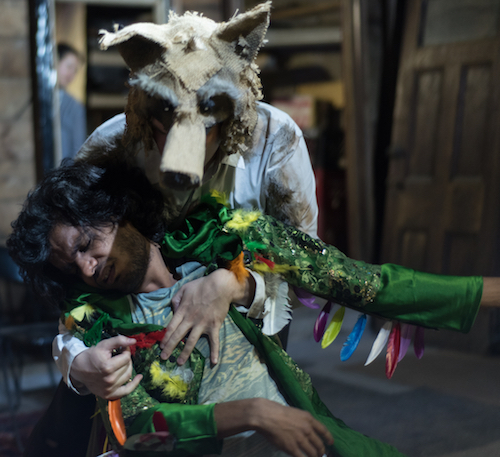 Nonetheless, those who stuck it out were rewarded with a visually inventive and passionate show about what happens when our furry and feathered friends are forced to make it on their own. Ishai Buchbinder’s play is billed as a dark comedy, but I would call it heavy on the dark, light on the comedy. There are puppets and animal costumes, but this is very much not a children’s show. In fact, my biggest issue with the production (other than that I should have brought a parka) is that I wasn’t entirely sure who it was for. It’s far too morbid and crude for kids, but not quite sophisticated enough for adults; it lay in an in-between space. It feels like Avenue Q (the Tony-winning puppet musical about living in New York as a new college grad) equally crossed with an Aesop’s fable and the horror of a Greek tragedy. In the play, young Mouse wants to join what seems like the cushy life of the House, but is warned off by her crotchety grandfather (Basel Daoud), who insists that “things only change for a little while.” He’s particularly concerned about the new Cat, who is welcomed happily by the sweet but incredibly dim Dog, and with caution by Bird, who’s more interested in listening to God through an Internet cable. However, things aren’t as good as they seem for a house pet, and a depressive, abusive owner makes them go from bad to worse. The best things about the show are the visuals and the actors’ total commitment to roles that could seem silly in less capable paws. The designers do excellent work with the space, creating places for shadow puppetry and hand puppetry as well as full body costumes (some arguing weeds provide some of the best jokes). The outsized props make the audience feel as small as the mice, with giant teabags, bottle caps and legs giving us a sense of the world’s scale. It’s worth going just to see these moments. The actors give it their all, with standouts being the winning hopefulness of Sofia Rodriguez’s Mouse, Amaka Umeh’s pitch-perfect rendition of Cat’s body language, and Michael Ruderman’s blinding smile and vacant eyes as the maniacal Dog, who is utterly incapable of understanding anything on his own, even when and why he is good or bad. Bilal Baig’s Bird shows us the ennui of being trapped in a cage by swaying so much I experienced sympathetic nausea. This dedication also means that for anyone with sound issues, that this is a very loud play, with not constant but consistent barking, screeching and pounding on doors at top volume. In the end, the show is alternately compelling and frustratingly inconsistent. Characters’ knowledge and intelligence levels seem to vary more than is credible for the sake of jokes, and there’s some reliance on cliché. Its Fringe Festival sensibilities make it seem like it might succeed better as a one-act, despite the cool post-intermission changes. The message, however, is a sobering one, not just limited to pets: an offer of stability often means a loss of agency, learned helplessness can be extremely dangerous, and savagery can lurk behind a genteel façade when resources run scarce. Resources are scarce for Pets, as there are only a few tickets left in the small space’s run. I wouldn’t say they’re worth a fight to the death, but a little begging might not go amiss.